WELCOME LIGHTS & ELECTRIC CANDLES include Chamber Lamps and Country Candle Lamps with clear steady-burning bulbs - except for "E" which has a Flicker-Flame bulb. Choose from Electric Candles & Battery Candle. Electric Candles "A - D" Have Clear Steady-Burning Bulbs. 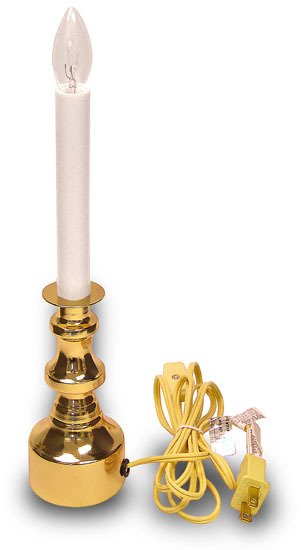 Electric Candles Have 6� Cords with In-Line On/Off Switch & Fuse-Protected Polarized Safety Plugs. Lamps Are For INDOOR Use Only. F) Country Style Candle Lamp. Welcome Light Electric Candle with smooth white plastic candle-look socket cover. 12"H overall including bulb. Brass color base. 6 Ft. Tan Cord has on/off switch and polarized plug. 7W bulb included. Individually boxed. Welcome Light Electric Candle with smooth black plastic candle-look socket cover. 12"H overall w/bulb. Chrome color base. 6 Ft. Black Cord with on/off switch and polarized plug. 7W bulb included. Individually boxed. Welcome Light Electric Candle with smooth white plastic candle-look socket cover. 9"H overall w/bulb. Brass finish base. 6 Ft. Tan Cord with on/off switch and polarized plug. 7W bulb included. Individually boxed. 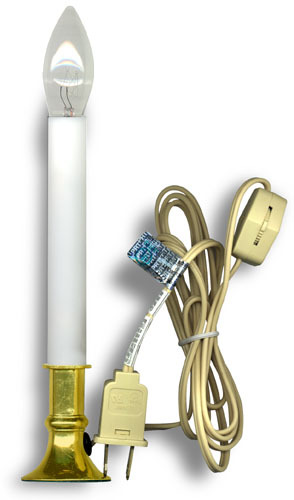 Chamber Style Electric Candle Lamp with smooth white plastic candle-look socket cover. 9"H overall with 7W bulb. 6 Ft. Tan Cord with on/off switch and polarized plug. Bright brass finish base. Individually boxed. Country Style Electric Candle Antique white plastic candle-look socket cover with simulated drips. 11"H w/1 watt silicone dipped Flicker Bulb. Satin Black base w/antique metal collar & 6� tan cord with on/off switch and polarized plug. Low Profile. Antique Ivory plastic socket cover is 1-3/4"H. & looks like a dripping candle. Candle and base are 3"H. Approx. 6"H overall with 5W silicone-dipped bulb. Satin Black plastic base with pewter-look metal collar. 5 ft. long power cord has on/off switch and polarized plug. Individually boxed. Clip-On Lamp Shade. Ivory shade is pleated cloth over white plastic. 4"H with 5" bottom dia. Fits "A - D" and similar lamps up to 15 Watts Maximum. Self-Adhesive Clip-On Lamp Shade. Smooth white plastic w/adhesive coating. Peel & stick. Decorate with paper, fabric, etc. 4"H with 5" bottom dia. Fits "A - D" and similar lamps up to 15 Watts Maximum.